Boba Fett's Advice to J and Mo is Simple--"Be Cool"
Last month Edward James Olmos, who portrayed Commander Adama in the new Battlestar Galatica, gave a shout out to our good friends J and Mo, who love science fiction. Perhaps their favorite sci-fi of all time is Star Wars. J even proclaims he’s a Jedi bfa. 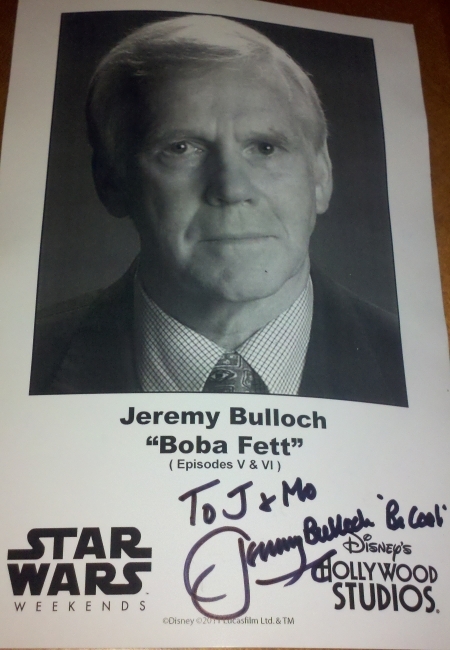 So I knew that when Jeremy Bulloch came to Disney World for a Star Wars Weekend Jeremy would want to give a special shout out to J and Mo. You see, Jeremy portrayed Boba Fett, the bounty hunter, in the original Star Wars Trilogy. I asked Jeremy how he became so popular when playing a character who was completely covered in costume. He suggested that he has so much charisma, it just oozed out of the costume and onto the screen. Makes sense to me. And in case you’re wondering how we managed to smuggle this highly sensitive video out of from under the noses of the dreaded Imperial Stormtroopers, well, it wasn’t easy. Number One Daughter had to use the Jedi mind trick to get the video out. This entry was posted on June 2, 2011 at 12:34 am and is filed under Special Events. You can follow any responses to this entry through the RSS 2.0 feed. You can leave a response, or trackback from your own site. Thanks Lancearound and Co. You guys really know how to make our day! !